Baltimore City Public Schools were opening on time. Unlike pretty much every other jurisdiction and every private school in the region that delayed the start of school by two hours, city schools were on a regular schedule. This evening’s announcement of a two-hour delay tomorrow – Thursday – brought applause from some, but mostly calls for school to be canceled completely. “The best and SAFE decision…. CLOSE SCHOOLS,” one woman wrote on Twitter. On Thursday, defending Baltimore’s decision not to cancel school entirely, a teacher pointed out that the school system is constrained by Gov. Larry Hogan’s 2016 order that schools in Maryland must not start before Labor Day. Many of those complaining online brought up school buildings they said are poorly heated. 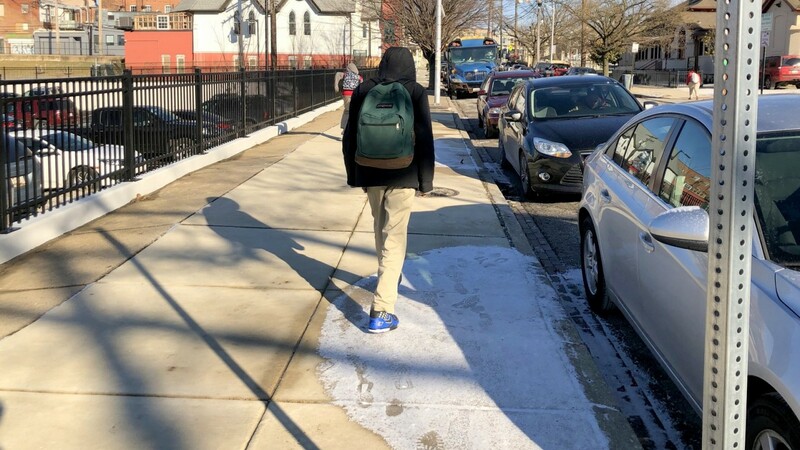 Students’ frigid walk to school, they pointed out, could end in a cold classroom. “I hate my child missing so much time, but honestly I can’t have my child in those conditions,” said Lakeanya Brown, who kept her daughter home from Patterson High School today. Brown told The Brew many classrooms at Patterson are cold this year, as they were last year. As a result, her daughter, a 10th-grader, stays bundled up in school. With weather this harsh – snow flurries swirled and temperature never reached above the low 30s today – Brown doesn’t take chances. City Schools spokeswoman Anne Fullerton said she’d heard of no reports of cold classroom problems at Patterson. 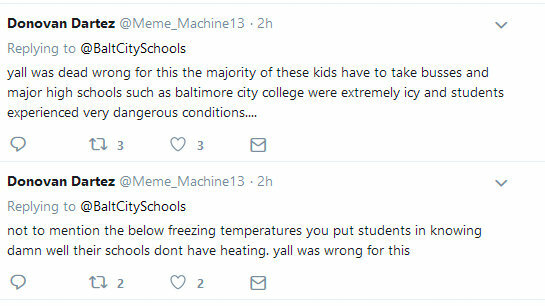 Last year, Baltimore schools made national headlines when students returned from the winter break to find classrooms flooded, boilers broken and frosty conditions in schools across the city. Problems were reported in 85 schools. Amid mild weather until now, those problems have been fewer this year, according to Fullerton, citing the district’s preventive maintenance efforts. A “building automation system” installed this year – temperature sensors placed in buildings and HVAC systems – alerts alert operations staff to sharp temperature drops in classrooms or buildings. Fullerton said school officials weigh conditions carefully and make their best judgment. “The process is we have people from our Transportation Department go out between midnight and 2 a.m. and assess the streets and sidewalks,” she said. The final call is made in the early morning. “It was their assessment [today] that the roads were clear,” she said. Fullerton said the school system typically errs on the side of saying open because, in addition to providing instruction, schools offer students meals, health care and other needed services. Thursday is forecast to be the coldest day of a cold week. Early-morning lows will be in the single digits. Wind chills will make it feel like 10 degrees below zero, meteorologists say. Fullerton said the school system is keeping a close watch on school building conditions with the remote monitoring system it has installed this year. – To contact this reporter: fern.shen@baltimorebrew.com.